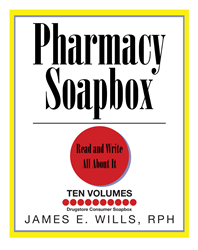 James E. Wills’s new book “Pharmacy Soapbox” is a riveting and informative compilation of reviews, stories and suggestions from drugstore consumers. Recent release “Pharmacy Soapbox” from Page Publishing author James E. Wills, RPH is both honest and enlightening; this work details experiences others have had while dealing with healthcare issues through a multitude of drugstores. James E. Wills, RPH, a Korean Naval Air veteran, retired pharmacist, writer and author has completed his new book “Pharmacy Soapbox”: over 500 pages of gripping and potent work that aims to inform the reader about their own healthcare, insurance and prescriptions. Published by New York City-based Page Publishing, after working the prescription counter for over forty years, James E. Wills, RPH, decided to write a book about consumers’ complaints about prescription insurance, drugstore products, the advertising, the labeling, and packaging. “The Success of the TV program, Sixty Seconds, is due to the fact that people have a story to tell,” says their CEO, Don Hewitt. This is the basis of “Pharmacy Soapbox”. Let the drugstore consumer tell their story! This book creates a soapbox for their comments to be heard about their total health care which may in turn benefit all drugstore consumers in creating better health care for their total medical needs and expenses for now as well as in the future for our children. At the present there is no platform (or soapbox) for the drugstore consumer other than the government, which at times moves at a snail’s pace plus the many cracks in the system in which many drugstore consumers fall through at times and are not heard. For additional information or media inquiries, contact Page Publishing at 866- 315-2708.